B.E. in Civil Engineering and M.E. in Social Engineering; joined National Land Agency of the Cabinet Office in 1982; worked in various positions in the governmental services mainly in the areas of spatial planning and disaster management, including United Nations Center for Human Settlements (Nairobi), United Nations Office for Humanitarian Affairs (Geneva), The Great Hanshin-Awaji Earthquake Memorial Disaster Reduction and Human Renovation Institution (DRI). At the present position since 2008. The Research Institute for Hydro-geological Protection is one of the Institutes of C.N.R., i.e. Italian National Research Council. Among its main objectives, it pursues the combination of high-level scientific and technologic research with dissemination and training, in order to increase the awareness and perception of hydro-geologic risks by the populations which are most vulnerable. Within this framework, detailed geologic and geomorphologic investigations have been carried out in the Vajont Valley, where in 1963 a huge landslide caused one of the worst disasters ever occurred in Italy after the Second World War. On October 9th, 1963, some 260 million cubic meters of rock fell into a reservoir contained by one of the highest dams in the world. This resulted in the displacement of 50 million cubic meters of water to overtop the dam in a 250-meter high wave. The tsunami caused the complete destruction of 7 villages and the death of approximately 2,000 people. We believe it is of paramount importance to disseminate the scientific knowledge produced by research institutions in order to avoid such disasters and to make the population safer and better informed. Knowledge means awareness and awareness improves preparedness and reaction. Therefore this is our mission: helping the populations to improve their awareness, disseminating our knowledge and involving researchers and scientists in this promoting activity. We ask experts to turn complex concepts into simple words and explain them to students in schools and to people living under risk conditions. 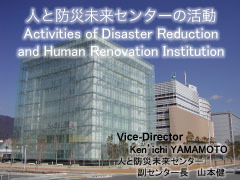 The Disaster Reduction and Human Renovation Institution (DRI) was founded in April 2002 with the mission of conveying the experiences and lessons of the Hanshin-Awaji Earthquake. Facilities were opened by Hyogo Prefecture with support of the Japanese Government. The DRI has operations for archiving and exhibiting information, and conducting research, training and on-site support, with which various networks have been formed. 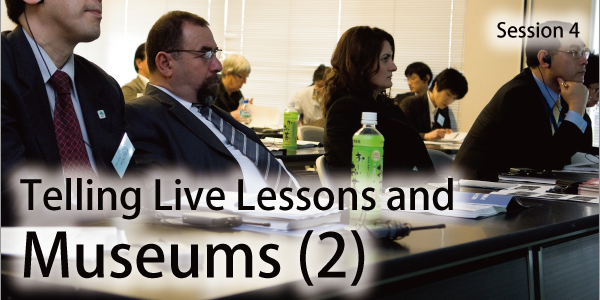 We have been called the “only disaster memorial of its kind in the world” and the "largest facility in Japan for disaster preparedness education". Some fifteen years have passed since the Hanshin-Awaji Earthquake and there is reason to worry that people are forgetting what happened, therefore our efforts are directed at getting young people to pass the word on to the next generation. 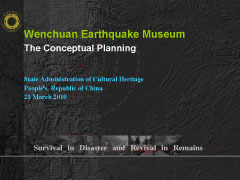 Director, Division Technology and Standardization, Museum and Social Heritage Department, State Administration of Cultural Heritage. From 2002 - 2006, the Western Neighborhoods Project worked to save four refugee cottages built after the 1906 San Francisco earthquake and fire. Earthquake refugee cottages, or "shacks" were built to house refugees from the 1906 San Francisco earthquake and fire. A total of 5,610 one room cottages, measuring 10 by 14 feet, were constructed to house over 16,000 San Franciscans in 11 refugee camps. Cottages had cedar-shingle roofs, fir floors and redwood walls. All were painted green to blend into the parks and public squares in which they were erected. When the camps began closing in August 1907, cottages were hauled to private lots and often two or more were joined to form larger residences. Of the 5,343 moved from the camps only a handful are known to be standing. In 1907 or 1908, four shacks were hauled from a refugee camp and joined together to form two cottages on Kirkham Street in the Sunset district of San Francisco near the Pacific Ocean. They remained there for many years and their role in the 1906 earthquake was forgotten. 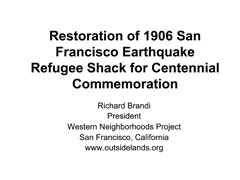 The Western Neighborhoods Project discovered the shacks and restored one in time for the 100th Anniversary of the San Francisco 1906 Earthquake and Fire. Our restored cottage was on display in downtown San Francisco during April 2006 with an exhibit on the science of making structures earthquake-resistant. Over the course of the month, we had over 13,000 visitors who learned the story of the earthquake refugee camps. The Western Neighborhoods Project won the State of California’s 2007 Governor's Historic Preservation Award for the restoration of the earthquake refugee shacks. The Award recognizes achievements in historic preservation and increases public awareness, appreciation, and support for historic preservation throughout the state. Richard Brandi is President of the Western Neighborhoods Project, a non profit historical association based in San Francisco. He is also an Architectural Historian with more than eight years of experience. He earned a B.A. from University of California, Berkeley and an M.A. in Historic Preservation from Goucher College in Baltimore, Maryland. Richard is a historian who meets the professional qualification standards set forth by the United States Secretary of the Interior, with specialization in the fields of history, architectural history, historic preservation, cultural resources management, and city planning. Mr. Brandi has worked for historic architecture firms in San Francisco and environmental planning firms in California and Mississippi. He was born in San Francisco and is a fourth generation San Franciscan. Before the 17th August 1999 earthquake, Sakarya was one of the most successful cities in Turkey which have been developing in socio-economic status. Unfortunately, the earthquake damaged Sakarya considerably by all means. In the 99’ Earthquake, 70% of the buildings in Sakarya was seriously damaged or ruined. According to the official figures, 3,891 people died and almost 10,000 people have been injured. After the earthquake, most buildings were damaged seriously, so, a major part of the center population has moved to the districts and villages near the city center. Adapazar? people realized in the morning of 17th earthquake that the city was ruined. Everyone supposed that only the region they were, was ruined, but they were wrong. Most popular streets and sites of Adapazar? ? the city center of Sakarya- were closed by the ruined buildings, even walking in these areas was impossible. Ground and first floors of unruined buildings had combined and most of these building had gone down. Moreover, there were some buildings that unsettled with their foundation and have gone down. Deaths were laid to rest to mass graves with shovels to avoid the epidemic diseases. 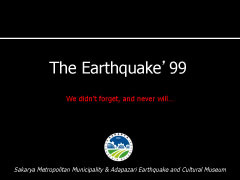 Sakarya will never forget the horrors of the earthquake. That day was the darkest and the most suffering time of the Sakarya’s history. But, we know we’ll be faced with this kind of event again. So, we believe that the importance of sharing our living stories for having individual control and safeguarding us from harmful effects of the disasters. Bilge Budeyri Dikmen was graduated from Urban and Regional Department in Architectural Faculty in Istanbul Technical University in 1999. She had also a graduate degree in Operational Research Department in Marmara University. She has been working in Sakarya Metropolitan Municipality for four years as an urban planner in the planning and project department. She is also responsible for twincity relationships of Sakarya's. She was born on March 26th, 1977, in Erzurum, Turkey. She is married and has a 4-year-old boy. 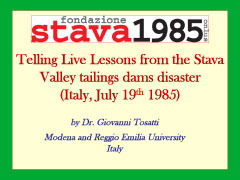 In 1985 the failure of two tailings dams at the service of a fluorite mine in the upper Stava valley (northern Italy) resulted in the propagation of a mudflow which completely devastated this alpine valley causing the death of 268 persons and high economic and environmental damage. The causes and responsibilities of this catastrophic event are described, stressing the low level of safety that in many cases earth structures of this kind have. The aftermath of the Stava disaster prompted the institution of the “Stava 1985 Foundation”, a non-profit agency dedicated to keep alive the memory of this and other similar disasters caused by short-sighted cost cutting, neglect, superficiality and the lack of attention paid to personal responsibilities. Indeed, the Stava 1985 Foundation was founded so that these mistakes would never be made again and so that the concept of safety and respect for human life would be consolidated. In particular, the goals and educational activities of this Foundation are examined and discussed. They consist in the running of a Museum and Documentation Center, located where the event occurred, and in a Remembrance Footpath that unravels across the places where the mine activity was carried out and where the tailings dams stood. The path is provided with information panels that reconstruct the story of the mine and of the Stava disaster. Conferences and other events related to the management of tailings dams are held in the conference hall of this center for the general public and for experts. The Stava 1985 Foundation has also sponsored a 2nd level Master in collaboration with Trento University in order to qualify young engineers in the proper construction and management of large geotechnical structures and make them aware of the risks involved. The Stava Foundation is also twinned with other institutions from places where similar disasters occurred, such as Vajont (Italy), Sgorigrad (Bulgaria) and Merrespruit (South Africa). 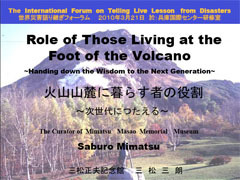 Role of Those Living at the Foot of the Volcano "Handling down the Wisdom to the Next Generation"
Many victims of a natural disaster do not anticipate it and lament their ill luck. The fact is, the Earth, active in nature, keeps causing disasters. No averting. We must prepare for them. Cope with them learning by experience how to minimize the loss. That came true with volcanic disasters. During the Pacific war, one volcano was born in Hokkaido. No circumstances at the time allowed of scientific research of it. Yet, a local resident was making alone, with his own devices, full records of the volcanic formation; even bought the new volcano with his own money to protect from human destruction. His friendly approach to the volcano led to the making of the volcanic hazard map, which eventually helped when Mt. Usu erupted in 2000. The loss and chaos proved minimal. Born in 1937 at Suita city, Osaka; studied veterinary at the college in Hokkaido. My dream to run a ranch there was changed by my chance acquaintance with Masao Mimatsu, owner of the volcano Showa Shinzan. Fascinated by his personality, and also by the volcano, I became son-in-low of Masao who had no heir. My small-scale museum was set up to conserve Masao's heritage - volcano and documentary records on its formation - which serve as teaching aids. Masao's bid to coexistence with volcanoes has been incorporated into the Lake Toya-Mt. Usu Geopark plan, which UNESCO-supported GGN "Global Geopark Networks" nominated as the first GGN in Japan. I am active committee member in the capacity of a professional. Mt. 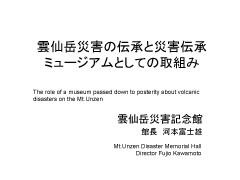 Unzen Disaster Memorial Hall was founded with a view to passing on experiences of disasters as a volcanic education facility and expressing gratitude to the warm support extended from throughout the country. The Hall designates June the 3rd as “A day of pray” and organizes an event to put fire to the candles that children made in memory of the victims. The Hall also provides a unique program for disaster reduction education that makes use of the Hall itself, and thus supports schools. In order to pass on disaster lessons to maximum number of target population and for maximum length of duration, the Hall continues to carry out educational activities on volcano and disaster reduction. 1955 Born in Kita-Kkyush City, Fukuoka Prefecture 1979 Graduated from Seinan Gakuin University, Faculty of Commercial Schience Appointed to the present position since August 2006, after 26 year career of working in a travel agency At present, Board Member of the Shimabara Tourism Board, and Board Member of NPO “GAMADAS Net” Engaged with a theme as to how many people I can pass on lessons of volcanic disaster as the one who has no experience in disaster.